Aldiko Book Reader Premium is one of the best Android eBook Readers out there. 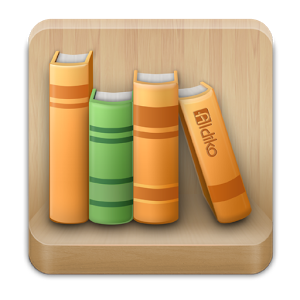 Aldiko has highlights (for EPUB files only), notes (for EPUB files only), book cover editing, home widget, import and export annotations features, unlimited number of audio books on personal bookshelf, gets faster update and does not contain advertisements. Support EPUB, PDF formats as well as Adobe DRM encrypted eBooks. Support eBooks from public libraries. Fully-customizable reading experience: adjust font size, font type, font and background colors, margin, alignment, line spacing as well as brightness to best suit your preference. The Aldiko Book Reader also supports night-time reading. 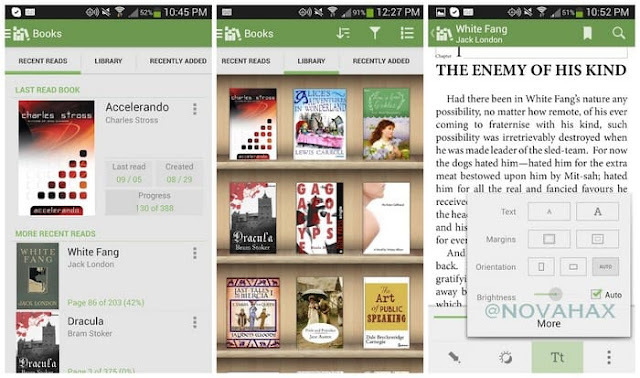 User-friendly interface: the Aldiko Book Reader supports both Android phones and tablets. You can create your own bookmarks anywhere in the book, rapidly jump to a different section of the book through the table of content. Advanced library management system: import your own EPUB and PDF files into the app to read them on the go; organize your eBooks by tags and collections. Aldiko will also remember your reading position automatically, bring you back to where you left off.